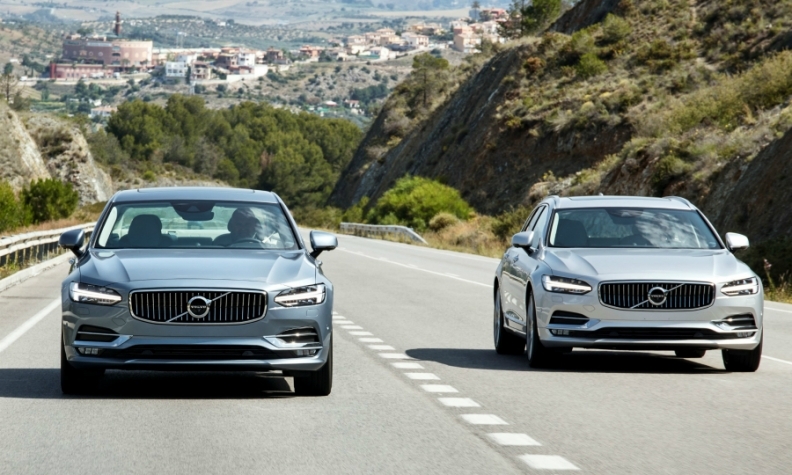 Volvo says its new S90, left, and V90 have proud, yet non-aggressive faces, characterized by their concave grilles. The cars have Volvo's refreshed Iron Mark in the center and Thor's Hammer lights. Volvo expects to take another big step forward in its revival by adding the S90 sedan and V90 station wagon but a challenge looms. The Swedish automaker anticipates it will be difficult to fulfill forthcoming orders for the new cars while keeping pace with the enormous global demand for its award-winning XC90 crossover. "The question is: Do we have enough material to meet the customer requests? That is a weekly challenge, but it is a very positive problem to have," said Kent Falck, who is director of all three models. Falck said Volvo's annual global sales forecast is 40,000 for the V90 and 20,000 for the S90. "Do I think we can sell more? Yes," said Falck, who is working to remove the bottlenecks in supply. He will need to move fast because market watchers expect the V90 to push past the Audi A6 Avant to reach the top of Europe's important large premium station wagon segment next year. The V90 will replace the V70. Volvo sold 27,841 units of the V70 globally last year. The new S90 replaces the S80, which accounted for just 10,330 units of Volvo's 503,127 sales last year. Volvo expects 80 percent of the S90's buyers will be new to the brand and that the sedan's top sales markets will be the U.S and China. Both of the new cars are loaded with high-end equipment. Volvo says its City Safety collision avoidance system has been upgraded to offer a world-first function: large animal detection. The feature can recognize an elk, moose or horse, day or night, and provide brake support to avoid a crash. The sedan and wagon also offer semi-autonomous driving technology that gives steering assistance to keep the car in its lane at speeds up to 130kph even if there is no car in front. The vehicles will be offered with a plug-in hybrid drivetrain, along with gasoline and diesel versions. Target buyers: Successful young entrepreneurs who are bored with traditional offerings in the segment. Connectivity: The cars use Apple CarPlay to offer a so-called "fully native integration," which removes the need to switch from the phone's screen to the car's screen. What's good: PowerPulse, which delivers instant turbo response from the cars' diesel engines. It does this by drawing air from the air filter via a compressor to a pressurized 2.0-liter air tank. When the driver wants to accelerate quickly, air is fed by a valve into the exhaust manifold to feed the turbo. The cars also offer flawless integration of an iPhone using Apple CarPlay and an easy-to-use touchscreen. What's bad: Pilot Assist hands back steering responsibility without much warning; voice recognition system had trouble understanding commands.